This page contains entries which can save you both time and money. These observations will also save you a great deal of aggravation and make you a better informed investor if in the beginning you understand the precious metal and rare coin markets are highly random and no one not even GoldDealer.com knows what the future might hold. 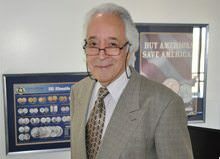 So take your time and read Rare Coins & Precious Metals – Questions and Answers and learn about reporting requirements, in and out of state sales tax, precious metal and rare coin diversification, collection appraisals, selling precious metals or rare coins through the mail, risk disclosure and buy/sell spreads. I include various approaches to investing but actual choices and distribution are your responsibility so consider carefully before instructing us as to what you want to buy or sell. Why? Because our sales representatives do not offer legal, investment or tax advice. Do not buy or sell precious metals or rare coins unless you understand and take full responsibility for your actions. Investment in precious metals and rare coins involves a high degree of risk including possible loss of principal; these markets are extremely volatile. They can also change dramatically when closed if an unforeseen “after market” develops. Because of these and other factors the precious metals or rare coins may not be suitable for all individuals. Do not proceed unless you fully understand the risks and rewards associated with this investment class. If you have questions before deciding please e-mail Ask An Expert. 1. How do I sell my bullion to CNI when out of state? The process is easy and just the reverse of buying. First, call and describe the product you wish to sell. It could be bullion coins or bars, certified coins, uncertified coins, banknotes, tokens or other numismatic items. Second, we quote our buy price right over the phone. If you like the quote and want to proceed simply ask for a computer confirmation but understand our quotes are subject to change if the markets change while you are considering your options. Third, a new vendor account is created in your name and you are given a Purchase Order Number as opposed to an Invoice Number when you purchase from CNI. At that point your quote is locked in and guaranteed. In other words we both agree to abide by our quoted price no matter what the market direction while the transaction is being completed. The selling party, in this case you, is obligated to follow through regardless of market direction because the buyer, in this case us, has acted on your behalf and at your direction so the trade is legally hedged and an obligation is created by our company. Once a vendor account is created and you ask for price confirmation, a Purchase Order Number is generated and you are legally obligated. So please take your time and be certain this is what you want before asking us to act on your behalf. If you are out of state securely wrap and fully insure the package in a timely manner. A timely manner means your package must be in the mail the same day your Purchase Order was confirmed to assure your “price lock”. If you want to sell a bullion product Friday night and cannot get to the Post Office until Monday please wait until Monday before asking for a Purchase Order. The package should be insured and include an inventory list, purchase order number, and daytime telephone number. Your money is mailed usually within 5 days or less after receiving your package. If you have additional questions call Brent Galaway or Ken Slater directly (800-225-7531). The US mail delivers millions of dollars worth of inventory to us each year. It is a safe and secure way of conducting business nationally. 2. The CNI Balanced Portfolio Concept. With all the hard asset choices available it is easier for investors to choose which combination best suits their needs. The most popular choices are gold, silver, or platinum bullion coins and bars, semi-numismatic coins or certified PCGS rare coins. And the more you understand about each area the more you will realize that each has a different potential. In other words, while they are similar in that they may react to inflation their short, medium, and long term price action can be significantly different. The best approach is to investigate all 5 asset classes and build a balanced portfolio which best suits your needs. This approach is the cornerstone of diversification and is recommended. Let’s say you want to invest $25,000 and are wondering how to proceed? You might want to consider placing $5000 in gold bullion, $5000 in silver bullion, $5000 in platinum bullion, $5000 in semi-numismatic coins and $5000 in PCGS graded rare coins. You may decide that silver is not for you and move that $5000 allocation into gold bullion but the idea is to remain diversified. This plan is based on the theory that over time, the dollar will lose value and hard assets will move higher because of this devaluation. And after you have the basics in place, the secret behind such planning is patience. All investors must plan for the long term and consider possible short term profits a windfall. Why? Because history has shown that years, perhaps even decades, may be necessary to make hard asset portfolios profitable. So the diversified investment theory is based on the systematic and long-term buying of these 5 different areas. As you learn more you will find all five related areas react differently to world events and have different supply/demand characteristics. The percentage of dollar allotment you devote to any area is arrived at by matching your specific objectives to your temperament. If you are a short-term player and want a fast in and out approach you should have a greater percentage of your money in bullion coins and bars as commissions are the smallest and replacement is easy. If you’re patient and are looking for profits based on past price history your selections will include high grade PCGS certified rare coins but the difference between the buy and sell on this asset class is larger so short term trading must be avoided. There is no guarantee that any combination will produce a profit and you could lose money if you choose the wrong combination but the idea is to hold these assets as insurance against the uncertain future of paper money. 3. Always avoid dealer-controlled coin storage programs, even those offered by reputable firms. Literally millions of dollars in investor funds have been lost when the company closes its doors and material “on-deposit” is nowhere to be found. We have recommended bank storage for years and found it totally safe and secure. If the volume of material is large, which might be the case for say, large silver bullion positions and you simply don’t want to store everything yourself consider a professional independent storage facility like CNT and Delaware Depository (DDSC) which is used by the Chicago Board of Trade (CBOT). 4. Avoid high-pressure sales tactics. 5. Make a distinction between bullion related bars or coins and certified rare coins. Make a distinction between bullion related bars or coins and certified rare coins. There is a big difference and not understanding this can lead you down a bumpy investment road. Read on for more details but the litmus test when investing in gold is to ask this question: “If the spot price of gold moves up say 4% will the coin I’m buying provide me a profit?” If the answer is yes, you are solidly in the bullion category. If the answer is no you are considering something beside bullion, which is not necessarily wrong, just be sure you know what you are buying. Here are a few more tips that will help define a bullion purchase: A bullion investment is defined by a bullion coin or bar which is not certified and trades for close to its weight. It will go up or down following the commodity price, and there is no rarity involved. Always figure the cost per ounce of a bullion product for yourself. It is easy to figure what a 1 ounce bullion gold coin should cost but more obscure when the bullion coin gets smaller. And don’t assume that because the dealer is cheap on large bullion coins he will also treat you right on smaller bullion coins. We are not a big fan of the so-called “confiscation possibility” which is often raised today, but if you are the smaller bullion coins like the British Sovereign (0.235 oz. Pure Gold) or the French or Swiss 20 Franc (0.186 oz. Pure Gold) work well. Just be sure to multiply their weight times the price of gold. Some dealers charge up to twice our selling price for these smaller bullion coins hoping the buyer will not compare prices. If challenged on their higher selling prices these dealers tell the uninformed investor that their coins are better quality and so are higher priced. This justification is not true because of the following: All large dealers buy these gold coins from the same international sources, pay the same price, and get the same quality. The extra money you pay goes into large overheads and commissioned sales. A certified rare coin may be weight related like the $20 gold piece, but usually is not. When investing in PCGS certified rare coins you are investing in rarity. Price increases depend not so much on higher commodity prices (although it helps) but on growing demand and shrinking supply. So how do you know if you are paying too much for a certified rare coin? Always check around and compare prices. After you have established a good relationship with a dealer this issue becomes less important but in the beginning do your pricing homework. 6. Beware of unrealistic dealer promises for there are no coin genies waiting to make you rich. 7. When comparing certified rare coin pricing note the price and grade carefully. A one point difference in the grade might change the price dramatically. When comparing certified rare coin pricing make sure you get the price and grade correct because one point difference in the grade will make a great deal of difference in the price. Also note that the two most acceptable grading services are PCGS and NGC and prices between these two services will vary depending on relative populations. And a word to the wise in that PCGS and NGC are the best in the trade but there are other grading services, some of which use similar looking holders, which do not produce consistent grading results and should be avoided. 8. Learn not to leave money on the table when selling your certified coins. Learn not to leave money on the table when selling your certified coins. Even with the grading standard established by PCGS in 1986 there could be some variance in the assigned grade. That is shop talk for making sure when you sell your coins the buying dealer is not upgrading the coins and putting the money in his pocket. A good rule to follow is that if you have old PCGS coin holders get an opinion as to whether the coin might upgrade before you sell. 9. It is your responsibility to report losses or gains on your income tax returns. It is your responsibility to report losses or gains on your income tax returns, but this type of reporting is not our responsibility. Contrary to what some believe your local coin and bullion dealer is not an agent for the government. They must follow a few simple rules which for the most part do not interfere with free trade. 10. Sales over $1500 within California are not subject to state sales tax, and neither is any product mailed out of state. Sales over $1500 within California are not subject to state sales tax, and neither is any product mailed out of state. 11. The foundation of rare coin investment centers on a coin's condition. The foundation of rare coin investment centers on a coin’s condition. This condition defines its rarity. As condition increases so does rarity. This is true because most people used early coinage for commerce thus making high grade uncirculated examples difficult to locate. This in turn made them more desirable and overtime more expensive. Certified rare coins are described using the Sheldon Scale. It begins at 1 for a just recognizable coin and progresses to 70 for a theoretically perfect coin. As the grade on the Sheldon Scale increases so does rarity and price. It is also generally accepted that the higher the grade the better the investment potential. Most investment grades fall somewhere between MS63 and MS66 unless you are considering very early federal issues. These early coins are seldom available in Mint State so PCGS circulated grades are the norm. 12. You will notice we have stayed between MS63 and MS66 because you get more for your investment dollar. You will notice we have stayed between MS63 and MS66 because you get more for your investment dollar. The cost of so-called “super-grades” (MS67 and higher) can be prohibitive and accurate pricing is sometimes difficult. Be careful of this area unless you really know what you are doing. 13. When considering rare coins stay within your budget, purchase the highest grade available, and balance rarity with popularity. When considering rare coins stay within your budget, purchase the highest grade available, and balance rarity with popularity. An MS64 example of any coin is better than the same coin in MS63 condition. Likewise an MS65 example is better than an MS64 if it fits your budget. The reasoning behind this rule is simply that as the condition of a coin increases, its rarity moves up dramatically. A one-point increase on the grading scale may increase rarity by 2 or 3 times. Also keep in mind that coin popularity can be more important than rarity. Popularity creates price increases. 14. Never purchase an investment rare coin unless it is graded by The Professional Coin Grading Service (PCGS). Never purchase an investment rare coin unless it is graded by The Professional Coin Grading Service (PCGS). It follows that you should avoid other grading services that are described as “just as good as or even better than PCGS”. This is important because the price of a rare coin is tied to its condition. A mistake in the grade can alter value dramatically. Differences in grading prior to PCGS (1986) led to difficulties. What was an MS65 dollar to one might not qualify to another. This issue was resolved when PCGS began independent grading and encapsulation of rare coins for a fee. PCGS is not in the business of buying or selling coins and developed “Third Party Grading” to such a degree that it is an accepted standard among America’s top 300 dealers. You can buy PCGS MS65 coins in California and receive fair value for them in New York. 15. Remember The 40-Year Rule in rare coin investing. Simply stated you should avoid rare coins that are less than 40 years old. Remember The 40-Year Rule in rare coin investing. Simply stated you should avoid rare coins that are less than 40 years old. Why? Because there has not been enough time to establish a secondary market that will provide valuable pricing information. Also understand that age does not equal rarity or value. An Indian Head cent in circulated condition is old but will never be rare because the US struck millions, most of which are still available today. Another general rule might help as a place to begin: Investors considering coins struck after the Civil War might choose an uncirculated example because they are available. From the early beginnings of the Philadelphia mint (1794) to the early 1860’s such uncirculated examples are rare and expensive so investors must now consider higher grade circulated coins simply because there is little other choice. 16. If possible, do business with members of The Professional Numismatists Guild (PNG). If possible, do business with members of The Professional Numismatists Guild (PNG). The PNG has represented the very best the coin industry has to offer since 1955. Members must past strict background and financial scrutiny while demonstrating complete competence within the trade. This organization is the only one that offers the consumer binding arbitration in case of problems. If you don’t like the way a PNG dealer treats you it is easy to contact the Guild’s Executive Director and arrange a simple three way arbitration that costs nothing and is legally binding. 17. What is your company policy on collection appraisals? Answer: Our policy on appraising your collection is simple and we guarantee your satisfaction. Call Ken Slater toll free (1-800-225-7531) and explain what you are trying to accomplish. Some folks can get a pricing answer right over the phone as Ken has been doing this for more than 20 years. If your intention is to sell your collection it may be necessary to send us the collection using registered and insured US mail. Either way Ken will explain value and procedure to make sure the collection is mailed securely making further evaluation easier. When we sign for your package, inventory control will check contents against your packing slip and notify you of its arrival. Ken will look up and grade each numismatic coin and make a note as to what we will pay for that particular item. He will do this for every numismatic coin in the collection and then add the value of any bullion product relative to the closing price the day of arrival. He will then call you with a total and answer any questions you may have including an explanation of how he arrived at the valuation. After you have all this information the decision to sell is up to you and the family. For the record we pay great prices because we need virtually everything saving you time and money. In 95% of all cases the customer is more than happy with our offer and we spend millions of dollars each year purchasing collections from all over the United States. But what happens if you don’t like our buying prices? That is no problem, we are here to make you happy so we will simply repackage your collection and mail it back to you. We use registered and insured mail and include a check refunding your original mailing costs. You really have nothing to lose and could get considerably more using our convenient system. If you already have an appraisal and want to know if you are being treated fairly, ask Ken for his guaranteed 10% better bid. If he can’t beat your best offer by 10% he will tell you and this will make your final decision easier. 18. How secure and private is my contact information with CNI? For your safety and security we at California Numismatic Investments shred all Fax’s, e-mails and hand written business notes using a professional service called Shred It (Santa Fe Springs, CA). We also do not share or sell information including names, addresses or e-mails for any reason and our site is encrypted. 19. The word numismatic is in your name, what exactly does it mean? Numismatics is the study of coins and currency in their historical context. As it relates to CNI we focus on the coins and currency of the United States but the formal discipline actually encompasses a much larger area. It includes virtually anything that was used as money or a form of exchange. A numismatist is an individual who collects, invests, or studies rare coins or money related items that were used to transact business. 20. What balance should I have between hard assets and my other investments? Everyone should make their own decision on this but a conservative approach is simply use 10% to 20% of your total investment dollars to purchase inflation-sensitive precious metals and certified rare coins. Most financial planners suggest the rest of your money should be in traditional vehicles like stocks, bonds, real estate and T-Bills. 21. I like silver bullion and lately it has been getting a lot of press, so what do you think about silver investment? I have always liked silver but let me also note that silver investment means silver bullion not a rare coin made of silver. There is a huge difference and some folks are fooled by quick-talking telemarketers into believing that silver coins in general are an investment in silver. When the trade talks about physical investment in silver we mean specifically silver bullion which trades for a small premium over melt value. And remember the only truly safe way to accomplish this is by taking physical delivery and devising your own safe storage. Common examples are: 1, 10, and 100 ounce silver bars, 500 count boxes of US and Canadian silver one ounce coins, and 1000 ounce COMEX bars (a very cheap way to own silver bullion but not my favorite simply because they are too heavy). Also included on the preferred bullion list are $1000 Face 90% silver bags (dimes, quarters, or half dollars struck in 1964 or sooner) and $1000 Face 40% bags (half dollars only struck between 1965 and 1969). Believe it or not the old silver dollars (struck in 1935 or sooner and containing about 3/4 of an ounce of silver) are not actually a bullion product because their premium is too high. There are other silver bullion products but this will give you an idea, just choose a well recognized product and add a small premium over melt. 22. Do you think it is a good idea to have fractional size gold bullion coins? All producers of bullion coins make 1/10 oz., 1/4 oz., and 1/2 oz. sizes and many survivalists believe such coins should be accumulated in case you need emergency size money. You will pay a premium for these smaller sizes but to some the added expense is worth it to have “real money” in hand if needed. 23. What is the difference between a 1 oz. gold coin and a bar of the same weight? Modern bullion coins and bars are very close to one another as far as acceptability and price so you really can’t go wrong with either. There could be a case made for saving a few dollars by choosing the lowest premium or avoiding very large bars because you give up the option of divisibility but in general each product will move directly with the market. 24. I saw a posted price that was too low relative to recent changes in the market. What do you make of that? We do our best to post accurate daily prices. There could however be typographical errors on rare occasions. For these we apologize and correct such mistakes immediately. We are not however responsible for such occasional errors and reserve the right to change such mistakes as they come to our attention. Please confirm all buying and selling quotes with a live trading person before making any decisions. Thanks. 25. The dollar amount over spot sometimes varies over time on your bullion coins. Why is this figure not constant? If you notice the difference between our buy and sell (the “spread”) is relatively constant but is subject to change with changing trading conditions. The dollar amount relative to spot will vary with the trader’s physical position. This happens because we hold the real coins and bars in inventory. When our trader’s position is too high he charges less and sells for less. When his inventory position is too low he charges more and pays more. That is why the actual price we charge over spot may drift over time. Also keep in mind that the difference or spread between bullion products may change, especially if markets are volatile. Precious metals and certified rare coins, involve risk, therefore profitability cannot be guaranteed. It is understood this firm, its employees or officers, may buy, sell, or have an interest in the recommended items. As with any investment our recommendations are subject to the buyer’s own good judgment and research. And while we try to answer each and every question in a reasonable manner, there is a limit to even our patience, so we reserve the right to refuse service to anyone. While due care has been exercised in development and dissemination of this web site, our newsletter, or other promotional material, there is no guarantee of correctness so this corporation and its employees shall be held harmless in all cases. Our employees are not registered financial advisers but most have years of experience in the gold business. It is further understood that employee’s suggestions or opinions, and all other promotional material is provided for informational purposes only. California Numismatic Investments, Inc. (GoldDealer.com) and its employees do not render legal, tax, or investment advice. No person knows for certain what the future may hold so price projections based on past events may not be reliable. We suggest each person investigate carefully all choices and options before investing in precious metals or certified rare coins. Use more than one information source, talk to a financial planner and take your time in deliberating which choices are best for you. Why? Because all precious metal and rare coin investments involve risk, you could lose money and so they may not be suitable for everyone. Because of the volatility inherent in precious metals and PCGS certified coins use venture capital only and in no case risk more than you can afford to lose. Also note that there are physical limitations when dealing with the precious metals and rare coins. We provide our “best effort” in making daily markets but sometimes, due to mint production or hedging problems or time constraints or system overload such a buy or sell quote cannot be supplied. 27. What is your spread between the buy and sell price of various products? In the precious metals business this answer will depend on market volatility, relative price and the nature of the product you choose. Bullion Coins or Bars: The difference between the buy and sell usually varies between 1% and 4% on gold and up to 5% on silver. This market is driven by speculators and folks who believe real money can’t be defined by paper currency. This market can be volatile and subject to dramatic moves depending on public confidence. Consider investing up to 70% of your hard asset money in this specific area. Semi-Numismatic Coins: An example of this area would be non-certified, circulated $20 gold pieces. The difference between our buy and sell is about 10%. So the spread is larger than regular bullion, but you get a rarity advantage which may lead to better price action and possible confiscation protection. Consider investing up to 10% of your hard asset money in this specific area. PCGS Certified Rare Coins: Of these three investment areas the difference between the buy and sell in this case can be the largest, coming in between 10% and 20%. This area can be a long-term money producer because an affluent collecting base pushes prices higher and studies have shown carefully chosen rare coins provide inflation protection over the long term. Consider investing up to 20% of your hard asset money in this specific area. So which area is the correct choice? Actually no person can tell you what the future may bring and hind sight is always perfect so once you make up your mind don’t beat yourself up if you are wrong, that is the beauty of diversification. Sometimes bullion leads the race and may outperform semi-numismatic or PCGS Certified Rare Coins. Over the longer term carefully chosen rare coins have done better than both bullion and semi-numismatic choices, but the spreads tend to be larger and past performance is not a guarantee of what may happen in the future. Depending on random market forces you may find one area outperforms the other two and it is just as likely that the others may catch up or surpass your original choice. This is true because public demand creates an unpredictable market dynamic, which is why we suggest a diversified approach. Since the 1970’s a combination of precious metals and rare coins seems to be the right choice. 28. It is important to make your own choices and exercise common sense in these markets. The precious metals and certified rare coins often change dramatically in price without warning. It is important to make your own choices and exercise your own common sense in these markets for the precious metals and certified rare coins can and often do change dramatically in price. Depending on market direction you could profit handsomely, make no money at all, or lose money. And you should always be aware there is a difference between our buy and sell prices. This difference can change without notice and is solely determined on a day by day basis relative to the trader’s position, market volatility, and the ability to resell products in the wholesale market. GoldDealer.com, our special reports, and other promotional material have been copyrighted by California Numismatic Investments, Inc. (CNI, Inc.). All rights are reserved and reproduction is prohibited. Thanks for reading and if you have questions please Email Ask An Expert before proceeding.